Transportation Minister Marc Garneau announced measures to help in the protection of the southern resident killer whale, the North Atlantic right whale and the St. Lawrence Estuary beluga. Federal Transport Minister Marc Garneau announced $167.4 million to support the recovery of three key whale species in Canada, particularly B.C. 's southern resident killer whale population. "The whales need our help," Garneau said. "We must act now because the whales can't wait." 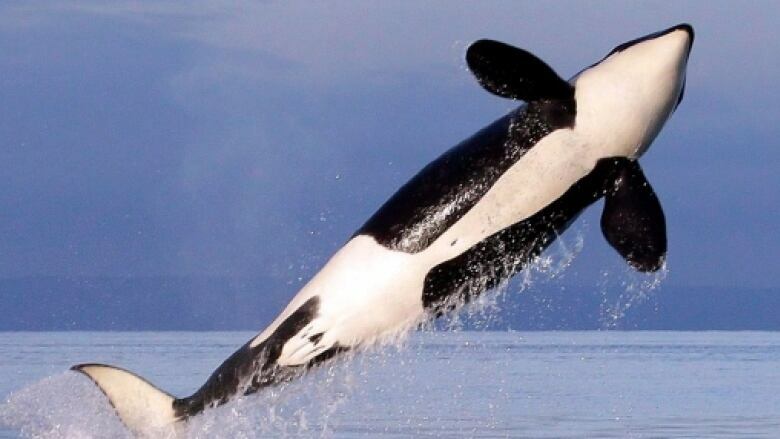 For the orca population in the Salish Sea, in particular, the federal government is focusing on improving prey availability, reducing underwater vessel noise and better monitoring of pollution. "It is a fragile species and doesn't have a high reproduction rate.… Our long-term objective is to see those [numbers] grow," he said. Reducing the total fishery removal of Chinook salmon by 25 to 35 per cent. Closing fisheries where whales forage for food. Introducing a new mandatory requirement for all marine vessels — including recreational boats — to stay 200 metres away from killer whales starting July 11. Adding to the underwater hydrophone network to measure and track noise impacts of individual vessels. The other two whale populations that will benefit from the initiative include the North Atlantic right whale and the St. Lawrence Estuary beluga. Parts of today's funding announcement have been previously highlighted as priorities. Last fall, Fisheries Minister Dominic LeBlanc promised that regulations to ensure no boat comes within 200 metres of southern resident killer whales in Canadian waters would be in place by spring. In March, the Canadian government announced more than $12 million in new funding for research aimed at protecting B.C. 's endangered southern resident killer whales. In May, LeBlanc announced plans to cut the allowable catch of Chinook salmon by 25 to 35 per cent. Michael Jasny of the Natural Resources Defense Council said the measures introduced today are insufficient. "It's moving in a positive direction, but all too slowly," Jasny said. "Right now the whales are under terrible stress. There's not enough food and when there's not enough food and noise and disturbance from vessels of all kinds, it increases their stress." The future of B.C. 's southern resident killer whale population has taken particular significance in light of the Kinder Morgan pipeline expansion project. The pipeline expansion, which will pump oil from Alberta to B.C. and offer access to global markets, is expected to potentially lead to a seven-fold increase in oil tanker traffic out of Burrard Inlet around Vancouver. Conservation groups argue the increased traffic could push southern resident orcas — now estimated at 75 remaining — to the brink of extinction. Tourism and whale-watching operations are also a concern. A recent report by CBC's Investigative unit found many residents of the Gulf Islands were alarmed over the behaviour of the growing whale watching industry. The residents reported that upwards of a dozen boats regularly descend on orcas pods, raising concerns about engine noise potentially affecting the whales' echo location, communication and hunting. This story has been updated to clarify that the potential seven-fold increase in oil tanker traffic as a result of the Trans Mountain expansion refers to tankers in the Burrard Inlet.